Attorney General Josh Stein, the Young Lawyers Division of the N.C. Bar Association and Feeding The Carolinas want you to join us for the NC Legal Feeding Frenzy. Over 1.8 million North Carolinians are considered “food insecure,” one of the highest rates in the country, according to a recent study by Feeding America. Many of these individuals are children, senior citizens, and disabled adults. Many others show the new face of hunger—individuals who have lost their jobs, are unemployed or underemployed. In many other instances it is a working mother or working parents who are still struggling to keep food on the table. Sadly, North Carolina has one of the highest rates of children under age five experiencing a lack of adequate food; nearly one in four. In fact, North Carolina’s food banks continue to experience record demand for services. In 2015-16 alone, the food banks in the Carolinas distributed nearly 182 million pounds of food and grocery products; the equivalent of over 204 million meals. 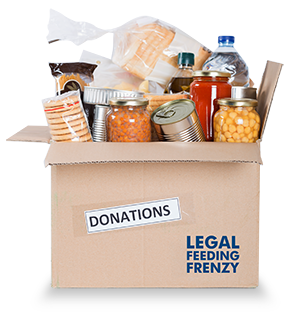 NC Legal Feeding Frenzy is an annual joint program of the NCBA Young Lawyers Division and Feeding the Carolinas food banks. It aims to fight hunger across North Carolina by uniting the legal community in support of local food banks. Over half of all soup kitchens, food pantries and other meal programs rely entirely on volunteers. Due to the devastating impacts of Hurricanes Florence and Michael, they need our help now more than ever. In response to this urgent need, the Office of the Attorney General, The Young Lawyers Division of the North Carolina Bar Association, the North Carolina Bar Foundation, and Feeding The Carolinas have joined efforts to create the North Carolina Legal Feeding Frenzy—a food and fund drive competition among all North Carolina law firms, law schools, and organizations to assist Feeding The Carolinas’ Food Banks. In this friendly competition, the law firm, school, or organization that raises the most food (based on a per person average—attorneys and staff) will be awarded the prestigious and highly coveted “Attorney General’s Cup.” In addition, Attorney General Josh Stein will present additional awards in categories including: Sole Practitioner, Small Firm, Medium Firm, Large Firm, Law School, Public Interest, and Corporate/In-House Counsel. Government/public interest offices and corporate legal departments are encouraged to participate as well and will be grouped into the categories listed above based on size. We invite you and your law related organization to help our food banks serve our hungry neighbors. Pre-registration (bonus points for early entries): now through 5:00PM February 26th 2019.
WHO: The North Carolina legal community, including lawyers (including corporate/in-house counsel), paralegals, legal assistants, practice administrators, law professors and law students. Families are welcome to be involved as well (age restrictions apply). Raleigh January 5 1-4 p.m.
Attorney General’s Cup Award Reception: Attorney General Josh Stein will recognize the NC Legal Feeding Frenzy winners in a ceremony on Friday, April 26, 2019, 2:00 p.m., at the Bar Center, 8000 Weston Pkwy Cary, NC 27513.